As automotive steels push beyond the gigapascal mark and new aluminum techniques promise new strength and savings, repairers won’t want to miss two major players from the competing metal industries during the SCRS OEM Technology Summit at SEMA. 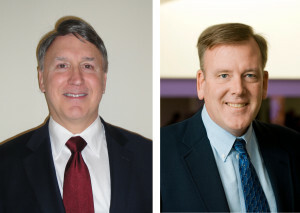 The Society of Collision Repair Specialists announced Wednesday that Doug Richman, vice president of engineering and technology for Kaiser Aluminum, and Blake Zuidema, director of automotive product applications for ArcelorMittal, will speak Thursday, Nov. 5, during the Repairer Driven Education SEMA series in Las Vegas. It’s a “good get.” Both Douglas and Zuidema were among the presenters at Automotive World’s Megatrends USA event, which features some of the automotive industry’s top technological experts, and both can speak to the future of their industries as well as the repairability of the light, strong and advanced metals in cars these days. Sign up today — space fills up for the three OEM Summit courses — for Doug Richman’s “The Future of Aluminum in the Automotive Industry,” and Blake Zuidema’s “The Continuing Evolution of Advanced Steels in Automotive Bodies” during the SCRS Repairer Driven Education Series event. Register here. The Repairer Driven Education series during runs Nov. 3-6 at SEMA and also includes new morning classes, a third OEM Summit event and an after-party. Most sessions are $75 in advance and $85 after the Oct. 16 early-bird deadline. The SCRS Sky Villa after-party Nov. 5 is $85/$100, and a full pass is $375/$400. Register at www.scrs.com/rde. Richman, also the technical committee chairman of the Aluminum Association’s Transportation Group, spoke at the inaugural OEM Collision Repair Technology Summit at the 2014 SEMA. This year, his “The Future of Aluminum in the Automotive Industry,” will discuss recent automotive aluminum advances and the possibilities going forward. He’ll also speak to safety, repairs and OEM-aluminum partnerships. Zuidema’s “The Continuing Evolution of Advanced Steels in Automotive Bodies” will offer research on how the steel industry has developed lighter, stronger automotive alloys and how those advances have prompted automotive design changes. He’ll also speak to how materials are evolving to hit future mpg goals and cost and repairability concerns. After Richman and Zuidema’s talks, they’ll be joined by a panel of automakers who heavily use the respective metals for a discussion from the OEM perspective. Those talks will address both the evolution of automotive design and collision repair as aluminum and steel advance. Richman joined Kaiser in 1996 and was appointed to his current position in 2001. Before joining Kaiser, Richman was vice president of Automotive Castings for Alcan Aluminum and his background also includes almost 20 years of experience in development and design management at General Motors. Zuidema joined ArcelorMittal’s Automotive Product Applications division in 2003 as a staff consultant, was promoted to manager of the division in 2004, and then to director in 2005. After working six years in research and development in the aerospace investment castings industry, Zuidema joined the former National Steel Corporation in 1990 where he held management positions in primary steelmaking and steel finishing research. Zuidema received his Ph.D. in Metallurgical Engineering from the University of Michigan in 1984.